post-title Why do you <3 Downtown Frederick? Your favorite business? That beautiful building you’ve admired for years? Everything?! Whatever reason you love Downtown Frederick, shout it from the rooftops with us this First Saturday by participating in our community heart bombing project! Find more First Saturday fun here. Stop by 30 N Market St between 5-9pm. 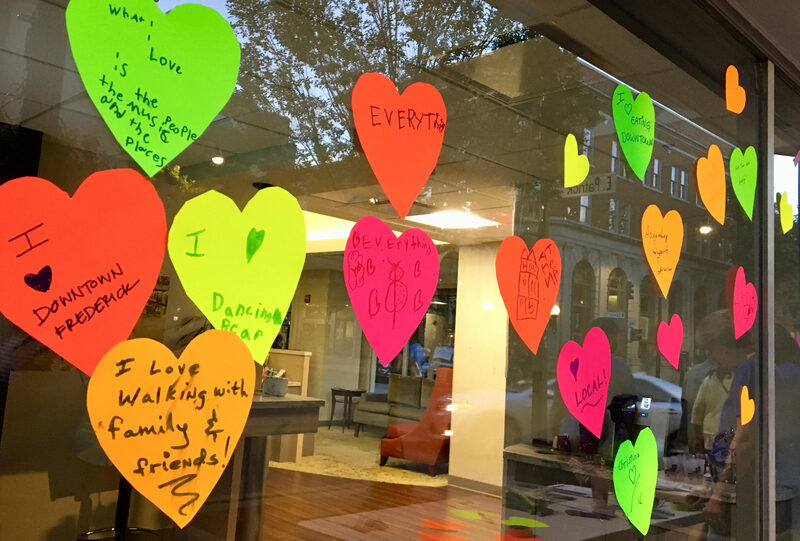 Make a heart and write why you LOVE DOWNTOWN FREDERICK. Take your heart and stick it anywhere you want in Downtown Frederick! We want to fill downtown with all the love and good vibes that make our city so special. Why heart bombing? Heart bombing is a social movement started by historic preservationists to send Valentines to the places we hold nearest to our heart. Our cities give us so much to love, so why not take a few minutes to give a little love back to them? Downtown Frederick Partnership has partnered with the Maryland Historical Trust and Preservation Maryland to bring this fun heart bombing activity to Downtown Frederick.